Born in Syndey, Nova Scotia, Herb McDonald worked in the steel mill. He took up carving in the late 1980s after his retirement, using only a jackknife. He was discovered by Cape Breton artist David Stephens. Herb enjoyed carving bathing beauties, small cats and occasionally constructed a whirligig. While most of his work was whimsical, he is known to have done a crucifix and an assemblage representing the Last Supper. He suffered from health problems and was not very prolific. 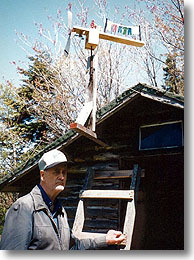 He attended the first Nova Scotia Folk Art Festival in 1989.